Naga_Fireball and others... what is this telling us? haha yes, tons of folks were perplexed by this cover. that maybe Asia had taken a big knock? With a picture as messy as this one, it's tough to know where to begin. vs. those which are shown in black-and-white. To me, black-and-white signifies age, decay, death, the past, "glory days" that actually didn't exist, economic ruin and perhaps even austerity. I know a lot of photos from the great wars were in black-and-white, maybe even some of the Asian conflicts too? I notice that a few of the politicians are shown with faces/bodies black-and-white whereas their suits (! a slur or pun?) are shown in color. I take this to mean that it is anticipated, some other personality (higher order) will assume power in these roles. I.e. Obama, Putin, Merkel; all depicted as strong personalities but in fact mere placeholders for real tyrants to come. 'Course I could be quite wrong. 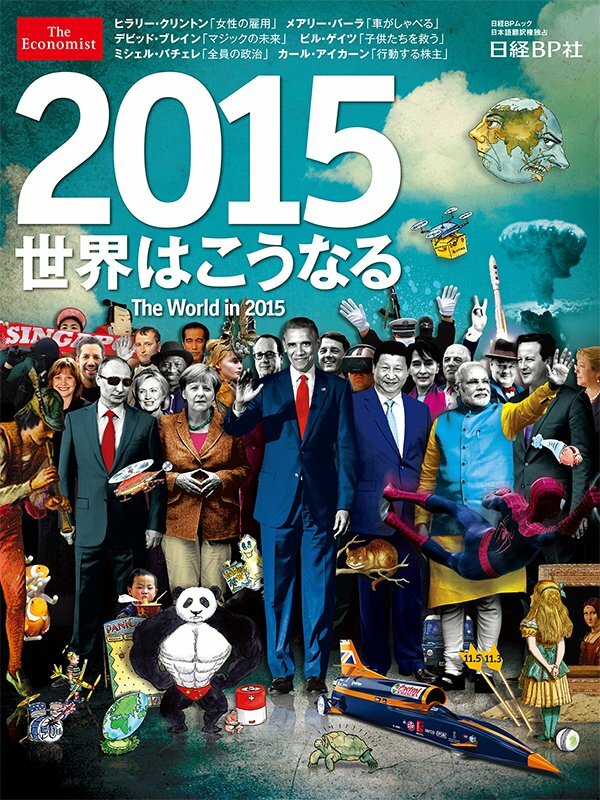 I notice above the nuke cloud on the right, is a "divided earth" cartoon with quite racist features. 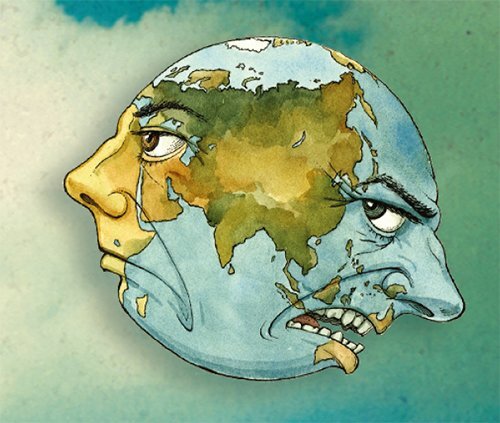 The stoic face on the left side with Africa as the nose, with Asian eyes, kind of looks like the Arab world, trying to ignore the aggressive other half, which looks kind of like a mean Caucasian face with perhaps a Jewish nose. It looks like a caricature a fellow trainee drew in tech school, of a student in our classroom haha. But less funny is the fact that the mean face is watching the placid young face on the left with envy and hate. Perhaps it's the Naval-strong Western powers eyeing the oil-rich easy pickings of the middle east with no success. The text on top I notice is in Asian language, I should know which ones, looks maybe like Korean, Japanese? I'm not 100% sure. with American flag inferior. Also it says 50th. Indicating the 50th year of some sort of pact or cooperative effort. Not sure how many years Economist has been running. They seem to be indicating a tongue-in-cheek trend toward Asianizing. 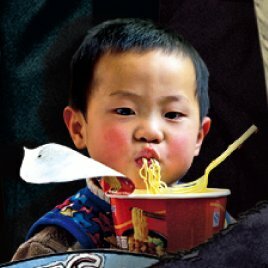 one young face is eating noodles, suggesting a time of plenty for Asia, also suggested by the fact so much of the top half of cover is written in Asian text. The west and countries who followed warmongering policies are pretty much shown in ashes and as we said before, black-and-white i.e. austerity. The drone carrying a yellow package saying "books" is Orwellian/Bradbury-ish. Yellow containers usually carry needles, lol, medical supplies, military equipment, etc pressurized cannisters, you name it. Generally hazardous things as in nature (wasps are often yellow). even reading on phones and computers, and people are hardly smart enough to see, they should be keeping back some books. In anticipation of the possibility, the internet might encounter some sort of massive deletion. Books would be contraband worth their weight in gold, to make up for the deficit in practical knowledge. Many books showing how to have been subtly removed from libraries and replaced with computers and crappy vampire novels. Just like in the book Fahrenheit 451, we are being bled dry of all real emotion and knowledge and past. It's super creepy how the drone is not only "bookkeeping" but also book stealing. The Churchhill V below the rocket launch is creepy too. Is that a joke about Saturn V? There sure have been tons of rocket and space/plane accidents in the last year or so. 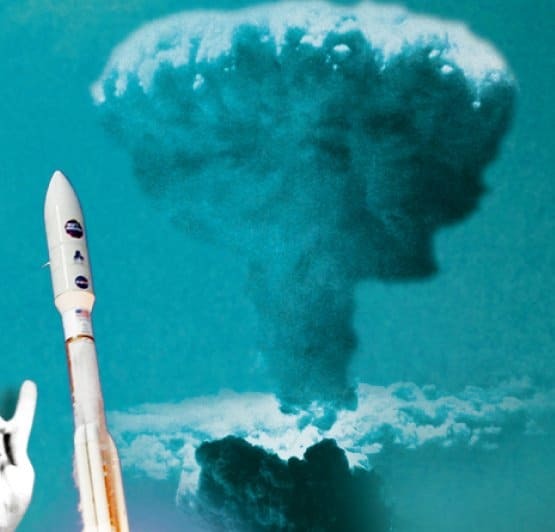 I'm not surprised that the Economist gurus put the nuke blast next to the rocket. It might well have been meant to imply that some launches would fail and panic the market. I know the USA in particular is an exporter of aerospace and commercial airline hardware. But the same companies who market that stuff are now marketing weapons capable of destroying even the most sophisticated aircraft. I doubt even the Blackbird could outrun a laser... food for thought. We have entered a whole new stage of world war and the fact it's been announced publicly suggests there have already been incidents. I don't think the companies would be telling everyone about the lasers being deployed if we weren't already in deep ****. Not sure what Spider-Man indicates but see he along with a flying piggy bank are surely exiting the visible picture. When the Western economy crashes, if this happens, our heroes will be suddenly absent. 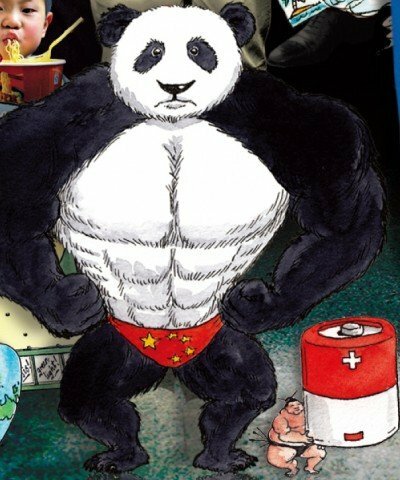 However the strongman Panda shown dead center is standing firm and publicly sturdy. gaining power from humble places i.e. agrarian places, widespread power base -- acceptance in the midst of posturing. Batteries shown. Rare earths race affects who produces the best batteries and Japan/China are way ahead of most. This explains a lot of the Islands conflicts between China/Japan/Russia. The outstretched palms are less welcoming than warning. As if to say "stay away don't look at the mess left over from our senseless wars and terrorism". especially the ones in Asia, because there was foul play for sure. The child is even more depressed now than the children after 9/11 but does not realize why. and flying dreams used to be a good thing for kids. I doubt so much recently. Singapore is shown in the midst of the colorful faces. Suggesting trade. ALso nearby are some wealthy moguls in color. Singapore might become a trade and tech hub for some reason in near future as Asia grows wealthier. Napoleon is shown nearby perhaps suggesting France is in on this..
Not sure what the ClownFish near the pied piper are for. Maybe investors who stay with aerospace investments even though people are getting stung. Clownfish live inside the sea anemones but don't get stung because they have a thick coat of mucus over their scales. I think maybe the clownfish are persistent investors whereas the rest of the market is panicking, kind of like 9/11 all over again. Not too far from the pied piper's area is a masked man. not sure if a hacker, terrorist, backer, or what he is. scary huh. particularly if it should crash. it would be like kicking the football lol. We shall see whether this silly bear is scary or friendly. 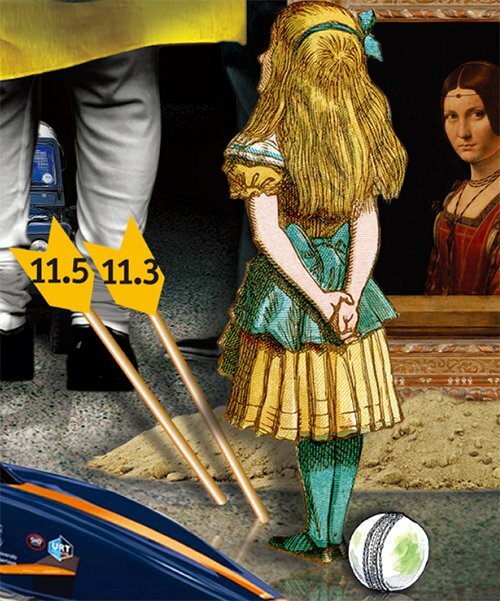 The Castrol racer next to the tortoise and Alice from Wonderland is certainly odd. Not sure what it means either. Usually a tortoise is shown racing a rabbit, but the White Rabbit is nowhere to be seen. 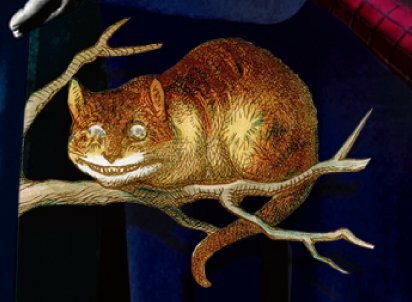 Instead we have the strange arrows near the stoic Alice, who is looking up at the grinning Cheshire Cat that no-one else seems to see. and either blame him for knowing all along, or wish he could have had a third term LOL. 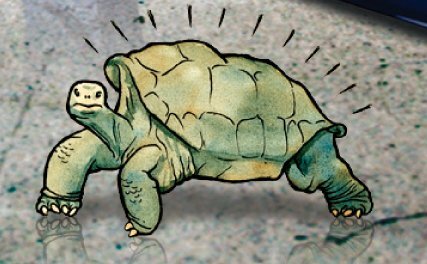 The tortoise is definitely going toward the batteries. Perhaps there's an aspect of energy development where USA is so sadly behind that it would make taxpayers absolutely furious. we are going to be shut out of the next great booming economy unless we act SO fast. I should know who the woman in the portrait is but it escapes me. She is wearing similar clothing to Merkel and both are staring directly, sagely, at audience. Suggesting longevity, silence, a master plan. But they are dwarfed by the chaos and noise. There is little room for grace or the growth of children in this picture. Very scary and interesting if you ask me! p.s. is that lady Gaga with the hawk wings on her head? in many films a hawk is associated with the sun god. it's interesting to see that she is facing toward Obama, perhaps an aggressive posture. the back of Obama's hand is almost up against her mouth, as if he is denying her blessing. 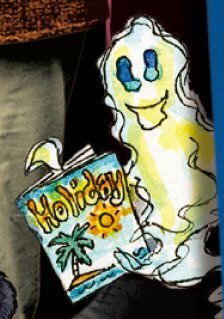 which also bears a sun symbol and is being flaunted by a ghostly/condom-resembling cartoon character. Perhaps vacation is one of the carrots on a stick for many Americans, and of course, the pursuit of Happiness (Cheshire cat smile?) is another carrot on a stick....... sad that vacation actually causes suicide for some folks. Ugh! They work too hard just like the horse from animal farm. p.s. Cristian's thread about what Angela Merkel did for Syria this week was astounding!!!! Ms. Fireball, thank you for directing your very discerning mental capacities in this direction. What you said about the chaotic nature of the cover brought to mind, out of chaos order. When I look at the symbolism of this cover the one thing that really stood out was the words "green light" on the magazine/ game with PANIC at the top. I found this article and am re-posting it here. The bleak and sinister cover features political figures, fictional characters and pop culture icons that will surely make the news in 2015. 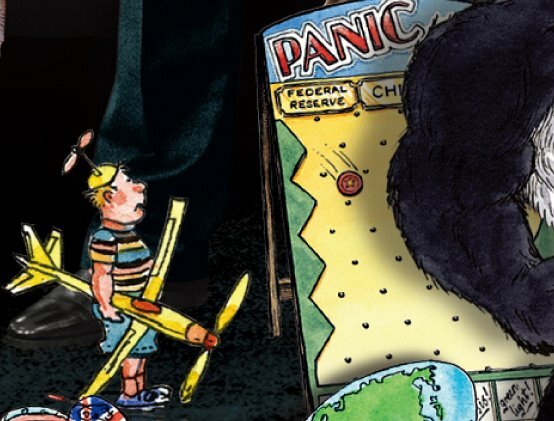 However, most importantly, it also includes several drawings that are extremely symbolic and allude to important elements of the elite’s Agenda. 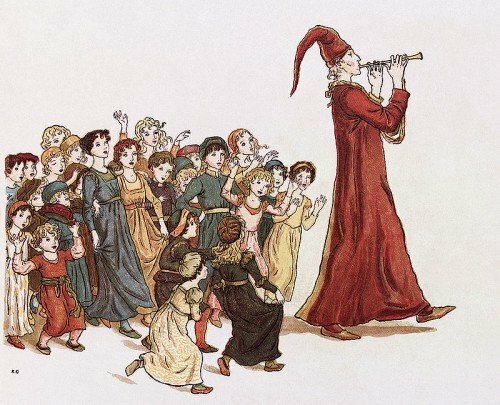 The Pied Piper leads the children out of Hamelin. Illustration by Kate Greenaway for Robert Browning's "The Pied Piper of Hamelin"
In front of Putin is a small aircraft on which is written Crop-O-Dust. 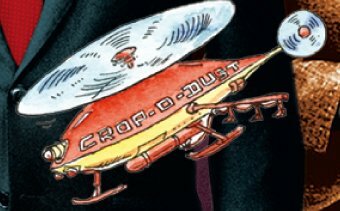 This refers to the concept of crop dusting which is “the process of spraying crops with powdered insecticides or fungicides from an aircraft.” Right under the helicopter is a kid … eating something. Unsettling. The original logo of the Fabian Society was a wolf in sheep's clothing. 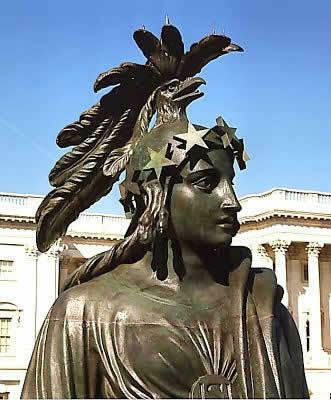 Interesting to note the seal of the S (Saturn) over her heart and in the full body photo she has a sword and a book, Justice and Liberty ... My interpretation is that SHE rules the heavens (stars as her crown) and the eagle representing her freedom, removing the seal of Saturn, obedience to Kronos she is Now the navigator. We are called to this task as Individuated-Source-Beings, as each of us finds our freedom so does the collective. Wonderful find, dear Christine. I had no idea. Does Minerva have any connection to Kronos? Super intetesting stuff. Also Gaga could be portraying Urania, the muse of heavenly portents. Stars & planets = Urania's Mirror I.e. soothsaying. Urania undoubtedly associated with fixed orbit visible planets like Saturn at times. 9/11 shocked many astrologers being that there was a lunar/saturnine conjunction iirc.